Barzal’s Days Numbered in Brooklyn? Three penalties in your NHL debut is not the way many pro hockey players want to start their careers, but for a first rounder the likes of New York Islanders’ Mathew Barzal, is it enough to send him back to juniors? At this point in the season, all signs currently point to yes. Thanks to the solid all-around play of another first round pick, Anthony Beauvillier, and Beauvillier’s unexpected chemistry with 2016 playoff hero Alan Quine and Ryan Strome, Barzal, who came out of camp in a prime position to be the Islanders number two or three center, now finds himself on the bottom of the Islanders’ depth chart. 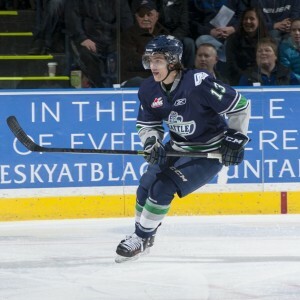 Able to play nine games in the NHL before his first professional contract kicks in, Barzal may have a year to think about his debut against the New York Rangers, as the Isles could opt to get him more seasoning in juniors before he plays a complete season. With the older Joshua Ho-Sang and Michael Dal Colle eagerly awaiting in Bridgeport as well, there’s a big chance Barzal may be done drinking from his one cup of NHL coffee this season. From the beginning, scouts predicted Barzal, and not Beauvillier, would be the stud forward. But Beauvillier’s ability to kill penalties, grind and create a role for himself have ultimately won the coaching staff over to him instead of Barzal, who is the flashy playmaking center. With the Islanders committed to Tavares, Brock Nelson, Casey Cizikas and Ryan Strome at center, Barzal, like Beauvillier has to find a new niche. That’s not to say Beauvillier’s game doesn’t need fine-tuning either, but with all of the Islanders centers starting to find consistency and chemistry, and Barzal’s role as a playmaker not being nearly as important as support on the wings, the first rounder’s services aren’t needed nearly as much as Isles brass thought they’d be at this point in the season. While one game is absolutely not a great sample size of a player the likes of Barzal, who has high-end passing and playmaking ability and in a sport where matchups are always key, he may be the odd-man out right now. While he will get a much longer look at some point, all the Islanders have to go on in terms of what Barzal can bring at the NHL level is a game the rookie would like to forget. There are, however, a few scenarios that can get Barzal back in the lineup. If Ladd doesn’t score soon, the Islanders could shake things up in a big way. Considering how well Beauvillier has played, the 19-year-old could get first line minutes. However, if Islanders head coach Jack Capuano takes a more rational approach, Brock Nelson, now centering the second line with Anders Lee and Jason Chimera, could get the opportunity to flank Tavares. This, of course, would allow Barzal to center a line with Ladd and Lee and would force the Islanders to have a third line that featured Ryan Strome, Chimera and Anthony Beauvillier, relegating Quine to the scratch box. The Isles power play has been ineffective this season, ranked 29th in the league with a paltry 6.7 percent effectiveness. While their five-on-five play has been solid over the past few games, their inability to score with the man-advantage would give Barzal, a noted playmaker, an opportunity to jumpstart it. The fact that the Isles lack a real playmaker away from Tavares makes Barzal a good option on the team’s second power play unit. With five points in as many games, Beauvillier has been near-perfect in a small but significant role on the Isles. Averaging less than 10 minutes a game of ice-time, if he has a few poor performances in a row, Capuano may send the rookie a message that requires him to watch from the press box. If that is indeed the case, Barzal has to do the same thing Beauvillier did — make the most of an opportunity.